Superman can’t visit the moon without fighting someone with his powers. Stern’s story is just the epilogue to “Time And Time Again”, so I’ll review this as one story. It’s back to the Legion period, this time after the founding members are no longer teenagers. Despite the former Saturn Girl’s pregnancy, she and the former Lightning Lad are drawn back to the moon as the Daxamite Dev-Em, sent into the future by Valor, ends up on a killing spree, even finding a Dominator base on the moon that has rigged the now-colonized moon to explode. 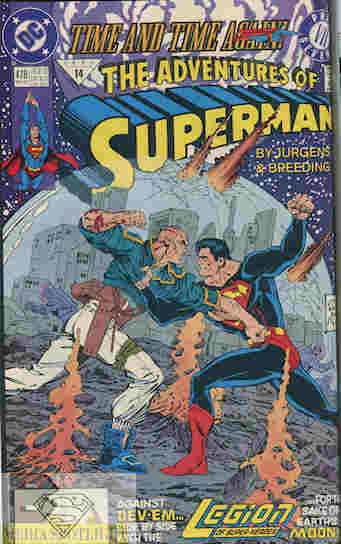 This is where Superman re-emerges, and joins with members of the Legion to save the moon and it’s citizens. As the Legionnaires leave, however, The Linear Man pops up again, insisting the moon’s destruction is not only part of his history but the way to send Superman home (despite the Legion having their own not-moon-destroying time machine), and triggers the explosives anyway. The moon is destroyed in the 31st century, but Superman is returned only a few hours after he left (although for him it’s been five months). He has a happy reunion with Lois and finally passes out from all the experiences he’s had. What they got right: The story does have a satisfying conclusion, at least for Superman. And the art is really good. What they got wrong: And I’m glad it is over because this storyline has gone on a bit long for me…and we still have two follow-up stories in this collection that I think is responsible for where I placed it in the longbox. I don’t know Legion lore so I don’t know if the moon was supposed to be destroyed, but considering it’s both colonized and rather important for life on Earth it seems like a waste. The writers seemed to be really pushing Superman through Legion history, possibly to promote the series and the Legion’s history because he was there so often while other writers wanted to send him bouncing around the past. Plus coming up with ways to avoid the easy solution of THE LEGION HAS A TIME MACHINE! Have it malfunction, make the whole story about Superman forced through Earth history while the Legion tries to put him back, and this might have been better. This is why I think they were just trying to push the history of the Legion Of Super-Heroes. Recommendation: It’s not a bad story overall, but it went on a bit long and had too much Legion in it for a story not primarily set in that period. Plus the annoying looks at whatever the other characters were doing besides anything involving this storyline. It does have enough good parts to mildly recommend or at least not to suggest skipping, but that’s all I can give you. Posted by ShadowWing Tronix on November 13, 2017 in DC Spotlight, Yesterday's Comics and tagged Dax-Em, DC Comics, DC Universe, Legion of Super Heroes, Superman, Time And Time Again.